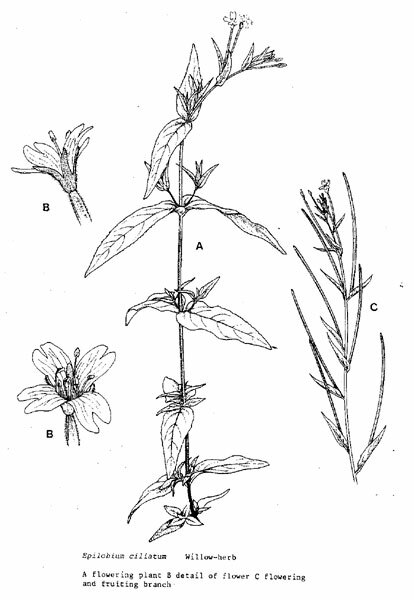 Growth Habit: Willow herb grows up to 80cm. 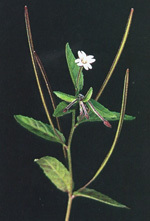 It is a branched weed that is almost hairless. It has broad leaves and short leaf stems. Type of Plant: A perennial erect herb. Flowers: Deep rose-purple coloured flowers are present. Fruit/Seed: Seed pods are long and cylindrical. Dispersal: Willow herb disperses by seed. Distribution: Willow herb is a very common weed of orchards and roadsides and bare areas. Willow herb can have a significant impact in orchards. Willow herb is resistant to glyphosate, therefore any area regularly sprayed with glyphosate for weed control may develop an abundance of willow herb. Mechanical. Cultivation and hand hoeing are effective. Mowing can help control the spread but needs to be done when the plant is not seeding. If seeded plants are mowed this will promote weed spread. Mulching greatly reduces seed germination. Herbicides. Spot spray. Herbicides registered in Tasmania include dichlobenil and glyphosate.